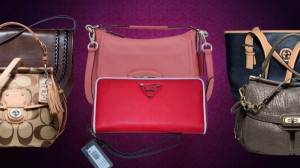 We Carry a Variety of Wholesale Handbags Liquidation Lots. Please review the listings below for further details. Brands typically found: Guess, Anne Klein, Nine West, Coach, Michael Kors, Vera Bradley, Kate Spade, Ralph Lauren, Fossil, Dooney & Bourke, Rampage & more as well as Nationally known Private Label brands. Styles may typically include: Evening Bags, Clutches, Satchels, Shoulder Bags, Totes, Purses, Cross Body bags, Bucket Bags, Reversible & More. Assorted lots of Bebe Handbags. Chic & Contemporary Fashion Brand. All items are brand new, in Poly Bags and with Retail Tags. Please see individual manifests for the specific contents, quantity, values & price of each available load.